Add a Second Hard Drive to your laptop using your laptop's optical drive bay. 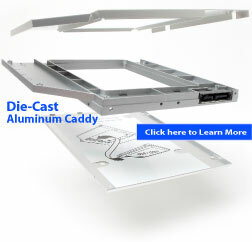 Eject your DVD optical drive and replace it with our Optical Bay Hard Drive Caddy. 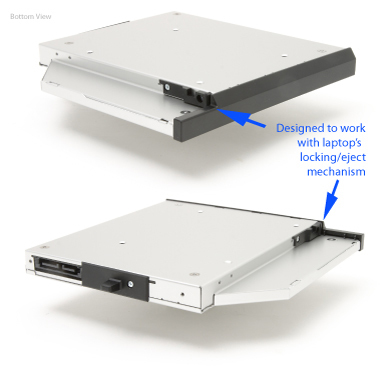 Works with the locking mechanism/eject mechanism of the Lenovo laptop DVD drive bay. This is a really sharp-looking well-engineered product. The front faceplate/bezel is finished in black designed to match the laptop. The metal bracket is manufactured in metal for heat dissipation, grounding, and EMI noise reduction. Fits in the DVD optical drive bay. Works with the laptop's eject mechanism.